The Right Words at the Right Time: Volume 2: Your Turn! From big cities to farm communities, from office cubicles to hospital wards, from Normandy Beach to Boston's Fenway Park, the contributors to this remarkable volume -- selected from among thousands in a nationwide search -- tell riveting stories about the words that changed their lives forever. You'll meet a "Plain Jane" from Seattle, whose world was rocked by a passing remark made by her favorite musician, backstage at a concert. You'll hear from the bereaved fiance of a 9/11 victim, who found hope in a note pinned to a teddy bear. You'll laugh with a beleaguered soccer mom, who reveals the single phrase she never wants to hear again. And your heart will break for a prison inmate, who recalls the one piece of advice he still wishes he took. In each case, words had made all the difference. 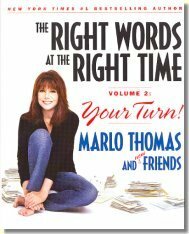 Marlo Thomas has once again tapped into the human spirit, assembling a breathtaking collection of beautiful and inspiring essays about the enduring power of words, and how their impact can last a lifetime. As a follow-up to her 2002 New York Times #1 bestseller, The Right Words at the Right Time, Thomas presents 101 new first-person stories that are at once universal and strikingly personal. Like the tale of a Gulf War veteran, whose life was transformed by just two words spoken by a young stranger at a Burger King. Or the aimless garage mechanic, who found salvation in a Help Wanted ad. Or the unsuspecting mother of three, who made a heartwarming discovery about her grandmother's "racy past." As this astonishing anthology proves, the "right words" can come from anywhere -- the pages of a dusty old songbook, the pulpit of a neighborhood church, the wreckage of Ground Zero, a hand-stitched sampler hanging on a wall, and a child's simple expression of love. The Right Words at the Right Time, Volume 2: Your Turn! is a collection to be read and read again -- a volume that will be cherished both by fans of the original book and anyone who has ever been touched by the startling and life-affirming magic of words.